Miss Evalyn is four (and a half - almost five) months old. 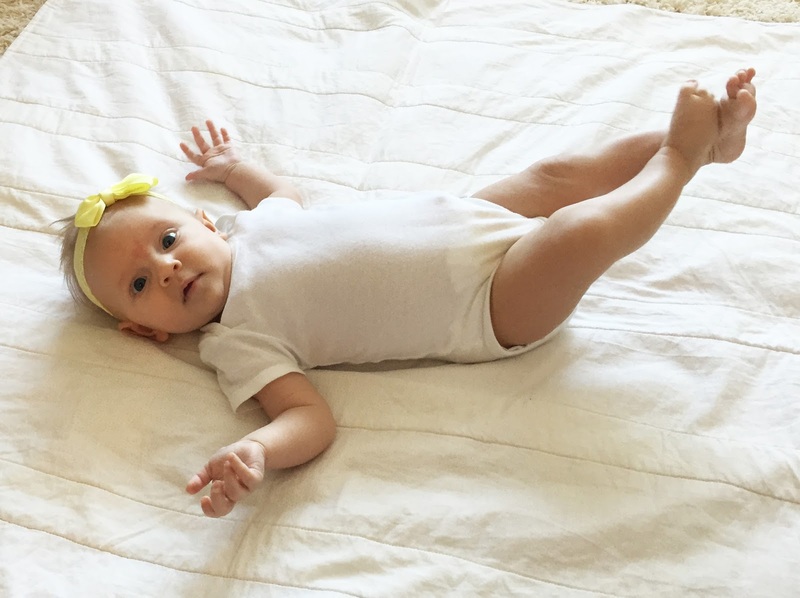 And these pictures are from her three month mark, because, #secondchild. So, there's that. I've got the months all blurred together in my mind. I swear she was born last week. But, I'll try my best to sum up the last two months. Evalyn is literally the happiest baby I've ever met. She smiles constantly. And, even in the midst of a tantrum, she will usually stop to grin. 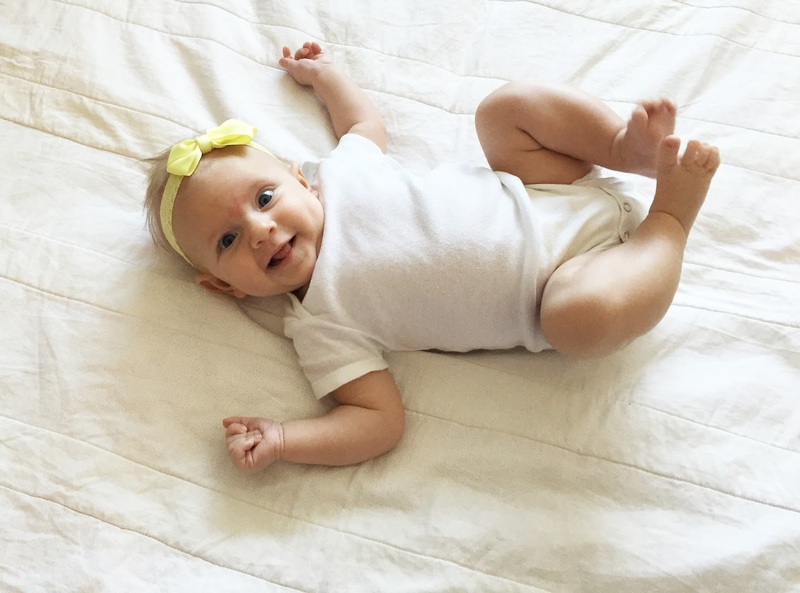 She started giggling around her three month mark, but only recently started laughing consistently. Evie loves her sister, though is incredibly wary of her most of the time. I would be too if a beast three times my size was spastically doing ballet all day long. At her four month visit Evie weighed in in the 75th percentile and is in the 95th percentile in length. She's a lean bean, and everyone always comments that she looks so small. Between her skinny features and seemingly small head - I get it. But, she still has the biggest feet. She loves to be in sitting position (or even standing), and tries to pull herself into sitting position constantly (core workout!). 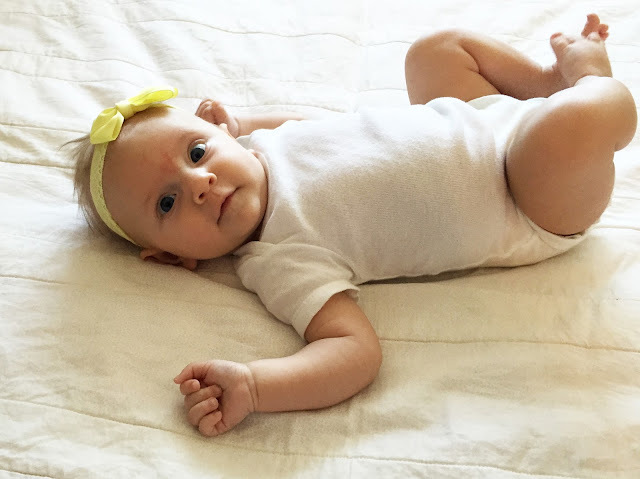 She started rolling from belly to back around her 3.5 month mark, and with a little struggle can now roll from back to belly. She is all over the place on the floor - though not intentionally (she ends up pushing and pulling herself all over the floor). There are so many times that I'm running around frantically, tearing through my day, going through the motions, and trying not to lose my mind - when this smiling, dimpled face greets me around every corner. I just can't get enough. She really does make us stop in our tracks and brighten our days. We all gush over her and about her to others all.the.time. And really, we can't imagine life before this one.